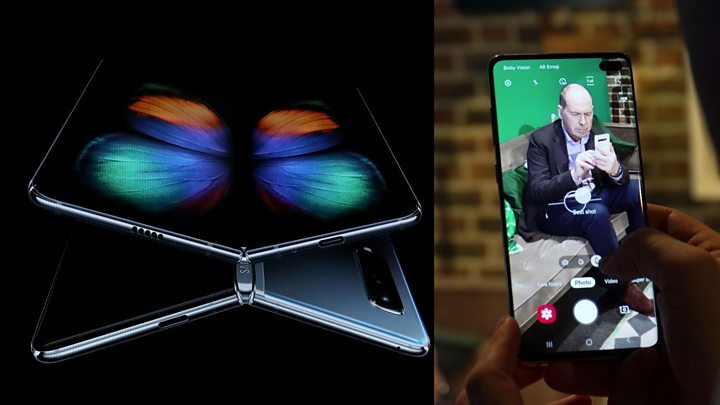 Samsung has unveiled a foldable smartphone - the Galaxy Fold - alongside a 5G Galaxy S10 handset and three other Galaxy S10 mobiles. The Fold will go on sale in just over two months time, earlier than many expected. 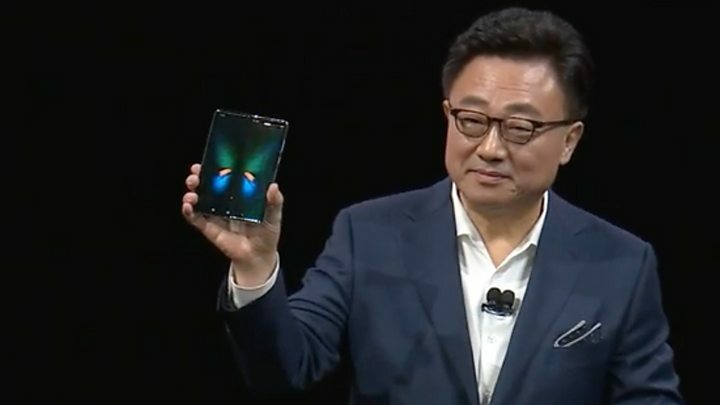 The Galaxy S10 5G features the firm's biggest-ever non-folding phone display and promises faster data speeds when networks become available. The S10 line-up also includes the introduction of a lower-cost model. Samsung had previously acknowledged that the cost of its S9 range had contributed to "lower-than-expected sales". Samsung said the Galaxy Fold would open up to create a 7.3in (18.5cm) tablet-like display and would be able to run up to three apps at once. A demo showed off "app continuity" features by which the device transferred from one mode to another much more smoothly than had been the case with an earlier foldable phone - Royole's FlexPai. One example involved a Google Maps screen appearing on the Fold's smaller front display and then expanding to a larger view when the handset was opened following a one-second pause. Samsung added that Whatsapp, Facebook, YouTube and Microsoft Office would also be optimised to suit the new form-factor. It said that it had designed a new type of hidden hinge system that would withstand hundreds of thousands of folds and unfolds, and contained a battery on each side to extend its runtime. In addition, the South Korean firm said the phone contained six cameras - three on the back, two on the inside and one on the front - to ensure it could take photos however it is held. A 4G version of the Galaxy Fold is set to go on sale on April 26 and will start at $1,980 (£1,515). A more expensive 5G edition was also promised. Samsung described it as being a "luxury" item. "Fold is an experience that gives people who want a phone but also a larger screen with no compromise on the phone experience," commented Carolina Milanesi from the consultancy Creative Strategies. "There's a lot of tech packed in there. And it makes sense to have kept it under $2,000 even if only for the psychological effect that has." But another market watcher still had doubts. "In theory, foldables are hugely attractive: they pack a giant screen into a small design," commented Neil Mawston from the research firm Strategy Analytics. "But in reality, consumers don't know exactly how they will work, and the applications for them are still fairly immature. "You can look back at history at the dual-screen folder phones that ZTE and NEC and others release. They haven't sold particularly well mostly due to price and lack of distribution. "So, there's good potential, but still a lot of uncertainty." In the short demonstration we saw today, Samsung's use case of watching entertainment, playing games and app multi-tasking will make a lot of sense for a lot of people. This is a tremendously creative feat of engineering. Folding screens seem like a good idea. What won't work, however, is the price. I've been at many launch events like this, and normally the worst case scenario for the firms putting on the show is a lack of applause when the price is announced. Today we saw something worse - loud grumbles, even some laughter. $1,980? Simply too much. Also, I wonder about some other aspects of this phone we can't judge yet as we haven't had a chance to hold it. When Samsung's head of mobile placed it into his suit pocket on stage, it landed with all the grace of a cartoon anvil. So: possibly heavy, with two likely-hot batteries, and a huge price tag. Creative, sure? Practical? For me, Samsung has fallen short - but the effort should excite gadget fans who have been longing for something different for so long. I suspect this device will have people flocking to stores to see it up close, if not to actually purchase it. The S10 series is likely to remain Samsung's focus when it comes to sales for the foreseeable future. The S10 and S10+ will cost more than the phones they supersede - beginning at £799 and £899 respectively when they go on sale on 8 March. But the S10e means the Galaxy S range now starts at a lower price-point - £669 - albeit with lower specifications to match. The S10 5G is yet to be priced and only has a vague "summer" release planned. "Having a 5G variant is strategically important for Samsung as it gives them the jump on Apple and helps maintain the firm's brand strength and perceived technology leadership," commented Ben Wood, from the CCS Insight consultancy. "It also gives the operators a tier-one brand for their 5G launches. "But as far as consumers are concerned, unless you have a very good reason to buy a 5G phone this summer, one of the other three S10 handsets is probably a better investment, and will be viable for use for many years." The launch comes days before Mobile World Congress in Barcelona - a trade event where Samsung's rivals will unveil new handsets of their own. The overall smartphone market shrank in 2018, but Samsung's sales saw a particularly pronounced drop-off as Huawei and other Chinese manufacturers wooed away customers. All four versions of the S10 are distinguished from last year's models by embedding the front cameras within their displays. Samsung refers to this as being the Infinity O design, but it is more commonly referred to as the "hole punch". The move allows the phones to feature a thinner top bezel without having the kind of "notch" found on many rivals. It has, however, caused the firm to ditch the eye iris-scanner introduced in the S8. Samsung says a new ultrasonic fingerprint sensor placed under the screens of the three higher-end phones offers close to the same level of security, and is more convenient to use than a scanner formerly placed on phone backs. It is based on a technology unveiled by Qualcomm in 2015. All versions of the handset feature wireless charging and introduce the ability to wirelessly charge other compatible devices in turn. This mirrors a feature first offered by Huawei's Mate 20. Samsung demoed the facility at a dual London and San Francisco launch as a way to recharge a new pair of Bluetooth headphones without having to use a separate cable or power mat. All four devices now feature a 10 megapixel selfie camera and introduce a 16MP "ultra-wide" rear version, which offers a slightly larger field-of-view than our eyes. The S10+ also has a second selfie camera to help it take depth readings. In addition, the S10+ and S10 5G now offer up to one terabyte of internal storage, which the firm says could appeal to those shooting lots of 4K video or storing many game files. "What's positive is that Samsung has moved away from software that nobody wants - like AR emojis and Samsung Cloud - and has gone back to its roots to deliver market-leading hardware," commented Ben Stanton, from market analysis firm Canalys. "So for the premium part of the market, these are good phones. "But my concern is that [they are still] not innovative enough to stop people from looking down to lower-price bands and being drawn into mid-range products from Chinese companies that are super-competitive." The introduction of a lower price tier may help address this. "The phone had to be larger to feature a bigger battery because 5G [data transfers] will drain it much faster," commented Mr Stanton. "But it was also smart to offer a large screen. "The use cases for 5G aren't yet defined, but one potential is to stream 4K video rather than HD. And having a bigger screen makes that more compelling." The original S-series handset was released days ahead of Apple's iPhone 4, and had a bigger 4in screen and microSD card slot in its favour. At that point, its main Android rival was the HTC Desire, and although Samsung's device was lighter, thinner, and had a more powerful graphics processor, some reviewers said it felt less "premium" in the hand than its competitor. The second-generation device saw its display grow to 4.3in, its rear camera increase in resolution to 8MP, and its processor move over to a dual-core design. It was praised for allowing owners to unlock it by pressing the home key, rather than having to press a button on top as before. And although some griped that it still felt plasticky, it sold in its millions - helping Samsung overtake Nokia as the world's bestselling mobile phone-maker. The third-generation model established a trend of including a bigger display but compensating for the growth by shrinking the size of the bezels. Its innovations included the ability to detect when the screen was being looked at, so as to avoid dimming the image. And it introduced S Voice, allowing users to command music to play and photos to be taken by speaking to it. Samsung added further touchless controls to the S4, letting owners scroll through text by making eye movements, and accept calls with a hand wave. A dual-camera feature also created photos that blended together the views from the front and rear lenses. Some critics found this all to be a bit gimmicky, and although the handset was a hit, there were reports that its sales fell short of Samsung's expectations. The S5 added a fingerprint scanner, which could be used to authenticate purchases via PayPal. It also introduced a black-and-white mode to help save battery life. But predictions that the firm would ditch Android for its in-house operating system Tizen proved to be inaccurate. The S-series split in two in 2015 with a premium-priced Edge version offering a screen that curved round one of its sides. A metal frame and glass back gave the handsets a more luxury feel, but they ditched water resistance and a microSD slot to make this possible. The seventh-generation phones looked pretty similar to their predecessors, but restored the ability to dunk them in water and slot in extra storage. Other improvements centred on the camera with better low-light and autofocus capabilities. The S8 and larger S8+ ditched the home button, took Samsung's logo off the front and added the virtual assistant Bixby. They also gained an iris scanner, which was billed as "one of the safest ways" to keep data private. After scandals involving exploding Note 7s and the arrest of the firm's vice-chairman, the launch helped return the firm to surer footing. The S9 and S9+ gained new camera features including a super-slow-motion video mode and a variable aperture - allowing owners to control how much light reached the sensor. AR emojis also allowed users to create animated cartoon characters that looked like them. But sales were lacklustre, and several months after it was unveiled Samsung acknowledged there had been "resistance" to its price. Cameras that poke out of the screen and four distinct models mark out the latest generation.